After years of development, when it comes to an office move you’ll likely only have days to deconstruct and rebuild your office’s IT infrastructure. Your equipment will then be in a new location that it was not designed for, your connectivity will likely be unproven and – undoubtedly – you’ll be expected to have all items fully up and running from Day 1. Given the potential pitfalls of IT relocation, we’ve created a checklist for your office move. Any office move requires planning, but when IT relocation is involved the amount of detail required can reach another level. Without careful desk mapping, labelling and planned packing, the first few weeks in a new office could be spent trying to reallocate telephone numbers to the correct desks or trying to locate the CEO’s ‘special’ keyboard…out of a pile of 100 other identical keyboards. Packing desk-by-desk is therefore a good idea. And as a pro tip, try to have as few staff around as possible when you are mapping, boxing and unboxing: this will prevent anyone taking a fancy to a nice piece of kit that wasn’t on their desk originally. As soon as you hear your company is due to move, start making enquiries about connectivity. If you’re very lucky, your next office will have a lease line you can take a share of. If not, three months is a fairly standard time for companies to have to wait to get a new connection in place. You’ll also need to ensure not only that connectivity can get into the building, but that there is a way of getting it into your office. If the IT architecture is not already in place, you may have some tricky negotiations with the building owner to drill holes and install cables. Best to plan ahead. If you’ve mapped the desks that all IT items have come from, it makes sense to ensure that you also have a plan of where they are going. And this is something that your IT person needs to be actively involved in. Architects and office interior designers may have grand visions of an elaborate geometric desk setups, but if it turns out you’re then trying to run 12 PCs and 6 phones off of two tatty Ethernet ports and a 4 gang multi plug, then you are setting yourself up for a disaster. Equally, no one wants a pristine new office where there’s a 6-metre run of rats’ nest cabling running across the main access way. It won’t look pretty, and health and safety will definitely have something to say about it. Ensure you get time in your new premises to map ports and assess power needs. Mapping out where desks will go with masking tape will help you ensure your ports are in the right places. If they’re not, ensure that data cabling is included as an item as part of the office fit out. And don’t forget to test cables before carpets or furnishings go down. There’s nothing worse than discovering the cable you need for your setup is a dud and now buried under the floor. If you’ve got an on-site server, you need to take extra special care of its relocation. And this goes well beyond just handling it with care. A server is a collection of different units (switches, firewalls, backup power supplies etc) working together in harmony. If you want to ensure they still work in harmony at the other end of your journey, power down your server in a logical way – don’t just pull all the plugs at once! Be sure you take a backup before you power down just in case. You’ll also need to prepare where your new server is going. 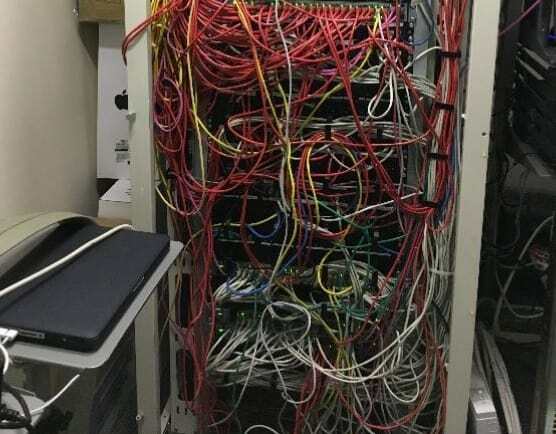 Ensure all your cabling reaches back to this point. It’s also worth installing a regulated power supply to ensure that your server is getting the right amount of juice. Lastly, don’t forget ventilation for your new server location. Your server won’t last long if it’s stuck in a stuffy cupboard producing 50 degrees of heat. An office move is the perfect time to assess your setup. IT relocation is a rare opportunity to make changes without any (additional) disruption to office working, so be ruthless. Get rid of under-performing desktop computers, scrap scratchy VoIP phones and replace dodgy server switches. Or dump your server altogether. That’s right, an office move can be the perfect time to switch from an in-office server solution to cloud hosting and virtual desktops. This can free up valuable floor space that would have been used for a server room. Given the stress of relocating an IT setup, it can be worth bringing in an outside company to support you. Akita are specialists in office IT relocation and can help take the pain and risk out of an office move. For more information please call on 0207 100 7232 or get in touch.